Siah Armajani: “Bridge Over Tree” 1970/2019; wood, steel and evergreen tree. Photo: Timothy Schenck. If hanging out at 900 feet in the air isn’t your thing, NYC’s newest neighborhood, Hudson Yards, promises plenty of fun things to do with your feet on the ground. As the first phase of the megaproject prepares to open this spring, New York-based design studio Snarkitecture will be introducing Snark Park, its first permanent exhibition space in Hudson Yards. 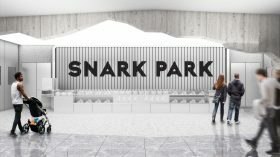 Known for their clever reinterpretations of the familiar, Snarkitecture’s Snark Park will be a site for immersive installations housing design environments for all ages to explore, discover and enjoy. 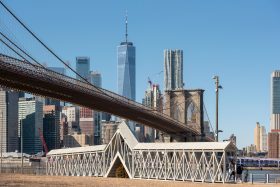 On September 12, the New York City Department of Cultural Affairs announced a search for applicants for a new pilot program called City Canvas, Archpaper reports. 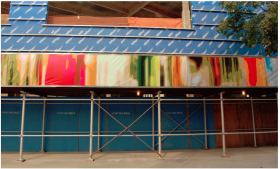 The program was designed to beautify New York City’s visual landscape by installing large-scale–and temporary–artwork on its endless construction fences and 270 miles of sidewalk sheds. The protective construction structures are an everyday eyesore for New Yorkers, but current building codes prohibit altering them. The City Canvas program circumvents that ban by allowing select artists and cultural institutions to add visual art to the visual affronts. 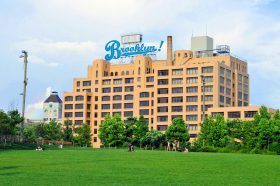 A rendering of the proposed Brooklyn sign in place of the “Watchtower” sign. Image courtesy of Susanna Briselli. “Brooklyn is a potent idea as well as a place,” according to Susanna Briselli, who explains in the Brooklyn Eagle that the borough’s name “summons vivid images and associations.” Briselli, who is an artist and photographer, suggests this potent chemistry is a compelling enough reason to create an enormous free-standing illuminated sign that reads “Brooklyn!” The massive work would be used to draw in more visitors and increase value, placed where the soon-to-be removed “Watchtower” sign in Brooklyn Heights now stands, or at another highly visible site such as Pier 7. To coincide with pride weekend, Gov. Andrew Cuomo announced that artist Anthony Goicolea had been chosen to design the first official monument to lesbian, gay, bisexual and transgender people to be commissioned by the State of New York. 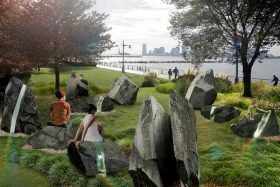 According to the New York Times, the statue will be built near the waterfront piers in Hudson River Park. The monument’s design features nine boulders bisected in places with glass, which can act as a prism, emitting a rainbow pattern. Governor Cuomo formed the LGBT Memorial Commission after the deadly attack at the Pulse nightclub in Orlando, Fla. in 2016; A request for designs for a new memorial went out in October of this year. Hudson River Park’s waterfront piers have figured prominently in the history of the city’s lesbian, gay, bisexual and transgender people. 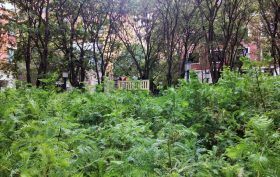 A big green sign that greets drivers from Manhattan coming over the Williamsburg Bridge reads, “Name It…We Got It!” Among the many things to which the borough can now lay claim: A dense grove of 4,000 redwood trees in the middle of Downtown Brooklyn‘s Metrotech Commons. It’s this unlikely juxtaposition that has brought the trees, with roots in prehistoric times and known to grow bigger than the Flatiron Building and longer than the Brooklyn Bridge, to this spot steps from Shake Shack. The mini-redwood forest is called “Lost Man Creek,” an art installation by Brooklyn-based artist Spencer Finch that opened on October 1. It’s a scaled-down (to one hundredth the size) replica of a 790-acre section of California’s Redwood National Park, planted in partnership with the Save the Redwoods League. 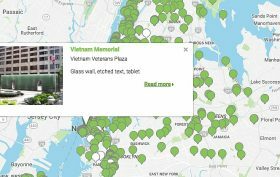 “New York City’s parks are host to the country’s greatest outdoor public art museum,” says the Parks Department as an introduction to their new interactive Public Art Map and Guide. First spotted by Brokelyn, the map features more than 1,000 public art sites and monuments across the boroughs. It also plots temporary exhibits and gives a brief description of them.